As analytical technology advances the volume of data, as well as the speed at which it must be processed, meeting the needs of our scientists poses unique challenges. Corteva Cloud Engineering teams are responsible for collaborating with and enabling software developers, data scientists, and others. Their work allows Corteva research and development to become the most efficient innovation machine in the agricultural industry. Recently, our Systems and Innovations for Breeding and Seed Products organization approached the Cloud Engineering team with the challenge of how to deploy a novel machine learning (ML) algorithm for scoring genetic markers. The solution would require supporting labs across six continents in a process that is run daily. This algorithm replaces time-intensive manual scoring of genotypic assays with a robust, automated solution. When examining the solution space for this challenge, the main requirements for our solution were global deployability, application uptime, and scalability. Before the implementing this algorithm in AWS, ML autoscoring was done as a proof of concept using pre-production instances on premises. It required several technicians to continue to process assays by hand. After implementing on AWS, we have enabled those technicians to be better used in other areas, such as technology development. A RESTful web service seemed to be an obvious way to solve the problem presented. AWS has several patterns that could implement a RESTful web service, such as Amazon API Gateway, AWS Lambda, Amazon EC2, AWS Auto Scaling, Amazon Elastic Container Service (ECS) using the EC2 launch type, and AWS Fargate. At the time, the project came into our backlog, we had just heard of Fargate. Fargate does have a few limitations (scratch storage, CPU, and memory), none of which were a problem. So EC2, Auto Scaling, and ECS with the EC2 launch type were ruled out because they would have introduced unneeded complexity. The unneeded complexity is mostly around management of EC2 instances to either run the application or the container needed for the solution. When the project came into our group, there had been a substantial proof-of-concept done with a Docker container. While we are strong API Gateway and Lambda proponents, there is no need to duplicate processes or services that AWS provides. We also knew that we needed to be able to move fast. We wanted to put the power in the hands of our developers to focus on building out the solution. Additionally, we needed something that could scale across our organization and provide some rationalization in how we approach these problems. AWS services, such as Fargate, AWS CodePipeline, and AWS CloudFormation, made that possible. Our group prefers using existing AWS services to bring a complete project to the production environment. AWS CodeCommit, CodePipeline, and CodeBuild are used for the CI/CD tooling. CloudFormation is our preferred method to describe, create, and manage AWS resources. Amazon Elastic Container Registry (ECR) is used to store the needed Docker container image. AWS Systems Manager Parameter Store is used to hold secrets like database passwords. AWS Fargate is used for the actual application stack, obviously. Compile some C++ code wrapped in Python, create a Python wheel, and publish it to an artifact store. Create a Docker image with that wheel installed and publish it to ECR. Deploy and test the new image to our test environment. Deploy the new image to the production environment. As mentioned earlier, the application is a Docker container deployed with the Fargate launch type. It uses an Aurora PostgreSQL DB instance for the backend data. The application itself is only needed internally so the Application Load Balancer is created with the scheme set to “internal” and deployed into our private application subnets. Our environments are all constructed with CloudFormation templates. Each environment is constructed in a separate AWS account and connected back to a central utility account. The infrastructure stacks export a number of useful bits like the VPC, subnets, IAM roles, security groups, etc. This scheme allows us to move projects through the several accounts without changing the CloudFormation templates, just the parameters that are fed into them. A complete discussion of all the resources for the solution is beyond the scope of this post. However, we can explore the resource definitions of the components specific to Fargate. The following three simple segments of CloudFormation are all that is needed to create a Fargate stack: an ECS cluster, task definition, and service. More complete examples of the CloudFormation templates are linked at the end of this post, with stack creation instructions. The ECS Cluster resource is a simple grouping for the other ECS resources to be created. The cluster created in this stack holds the tasks and service that implement the actual solution. Finally, in the AWS Management Console, the cluster is the entry point to find info about your ECS resources. The ECS Task Definition is where we specify and configure the container. Interesting things to note are the CPU and memory configuration items. It is important to note the valid combinations for CPU/memory settings, as shown in the following table. The ECS Service resource is how we can configure where and how many instances of tasks are executed to solve our problem. In this case, we see that there are at least minimumCount instances of the task running in any of three private subnets in our VPC. 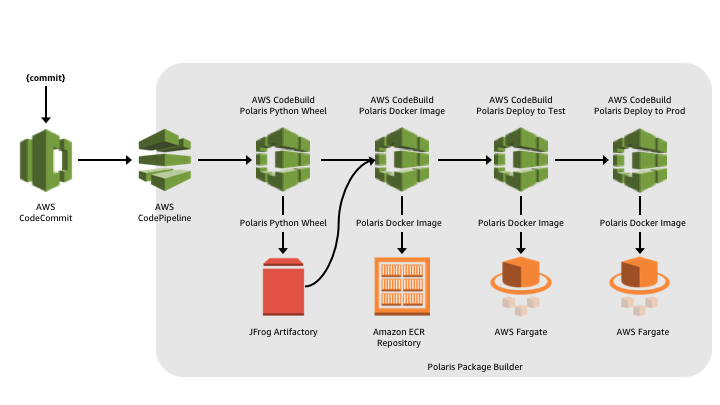 Deploying this algorithm on AWS using containers and Fargate allowed us to start running the application at scale with low support overhead. This has resulted in faster turnaround time with fewer staff and a concomitant reduction in cost. Sandra Milach, Director of Systems and Innovations for Breeding and Seed Products. We are distributing this solution to all our worldwide laboratories to harmonize data quality, and speed. We hope this enables an increase in the velocity of genetic gain to increase yields of crops for farmers around the world. You can learn more about the work we do at Corteva at www.corteva.com. 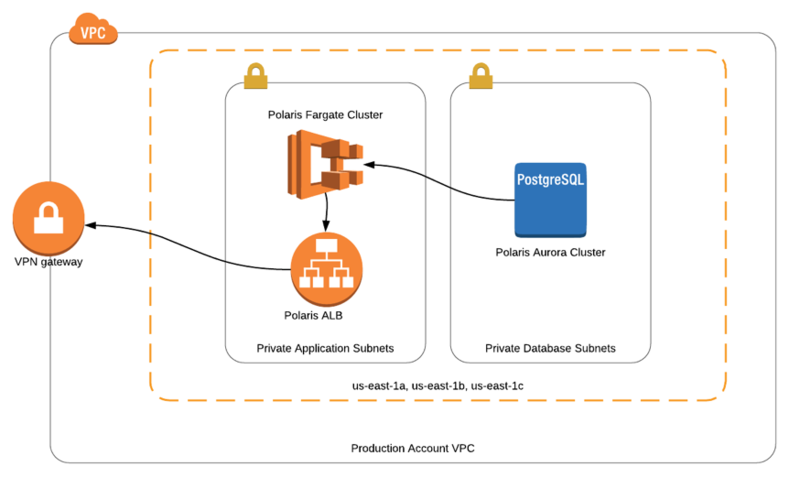 Note: the components in these repos do not include our production code, but they show you how this works using Amazon ECS and AWS Fargate.